Typically, in January, I relish getting back to my studio. It’s my happy place and I keep all that winter darkness at bay by turning on all my lights. I pull out those treasured pieces of fabric acquired over the past months and treat myself to play time. This week I decided to try my hand at working with Sharpie markers, Inktense blocks and pencils. I had purchased a luscious piece of hand dyed gradation fabric in Houston last November and I had also purchased a companion over-dyed cotton print from the same person. They were probably from the same dye lot so they played well together. I drew out my sketch of the design then tried some elements of it on a scrap of fabric using a grey Sharpie ultra fine tip marker. The Sharpie would glide over the fabric so wonderfully BUT every time I would pause a large blob would form. I soon learned to lift off the fabric every time I was unsure where to go next. 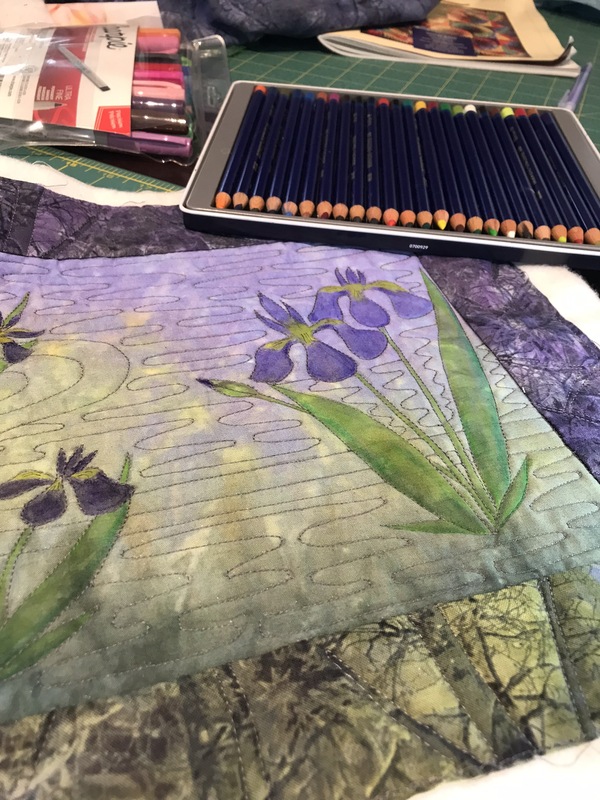 Just as in quilting on the longarm, practicing with pencil and paper, then immediately grabbing the marker and repeating the lines on the fabric ended with the best result. The secret was to keep moving and lifting. I also got out my fabric medium and No. 8 angle detail brush. 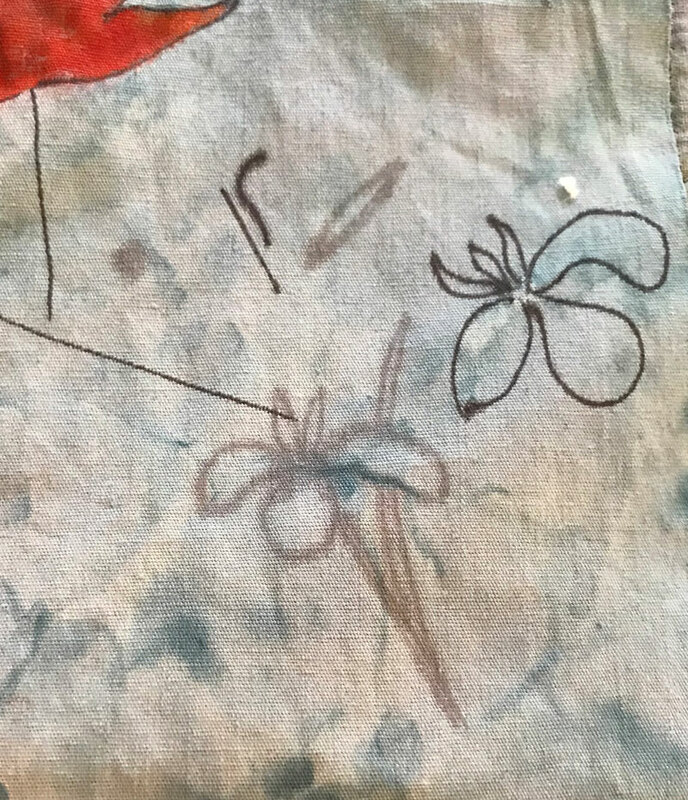 I covered a small area of leaf or petal with the fabric medium, using a very small amount on the brush, then lightly colored in with Inktense block or pencil. When brushing over the light markings they magically blended together. This was the best way to work with Inktense on fabric. If I used water, the color would spread too much and move beyond where I wanted it to move. Once the colors were blended the way if wanted I would move on to the next leaf or petal. It was important to get everything right while it was still wet. 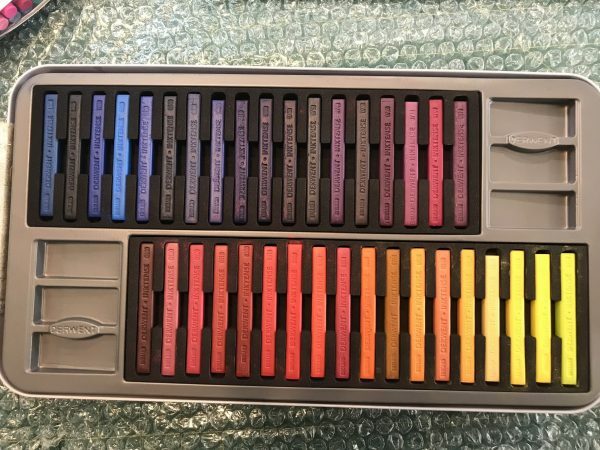 Once the colors dried, it was not really possible to change them. I found that the color was also rather translucent. The purple/blue of the iris came out much darker when colored on the green background than on the lavender background. I waited until the purple dried to add the yellow since I didn’t want them to blend. At this point I drew all the quilting lines with my Sharpie marker. I wanted to make this quilt entirely on the domestic machine and I didn’t trust myself to a good enough job free-handing those quilting lines. Yes, I actually used my walking foot to quilt all those back and forth water marks. I just needed more practice so I could trust myself, I guess. Sigh… some day. Somehow, I am much more tense when quilting on the small machine. My back and arms start aching very quickly. I can do this in no time flat on the longarm with little pain. It’s just a matter of what you are used to, I guess. One thing I learned doing this project was the importance of making my drawing fairly large. The smaller petals and closed flower buds were difficult to color in with my brush. 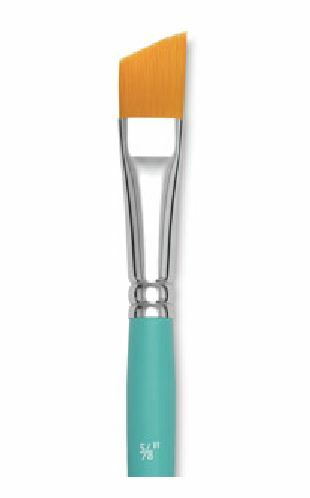 I had smaller brushes but the bristles didn’t offer enough control. I trimmed the quilt to the size of my canvas and added a facing to the quilt. You can see how I did that by watching my free video. Just click on “Free Videos” in the above menu and scroll down to the one titled, “Sew Facings Like a Pro”. I painted my canvas black all around the edges with acrylic paint, back front, leaving the front center white. I then spread gel medium on the canvas stopping just short of the edge and used some pressure to fasten the quilt to the canvas. I always sign these small quilts on the front with a black sharpie marker. That was fun and I’m eager to experiment some more with my Inktense blocks and pencils on silk. Give it a try and let me know how it goes! Thank you. 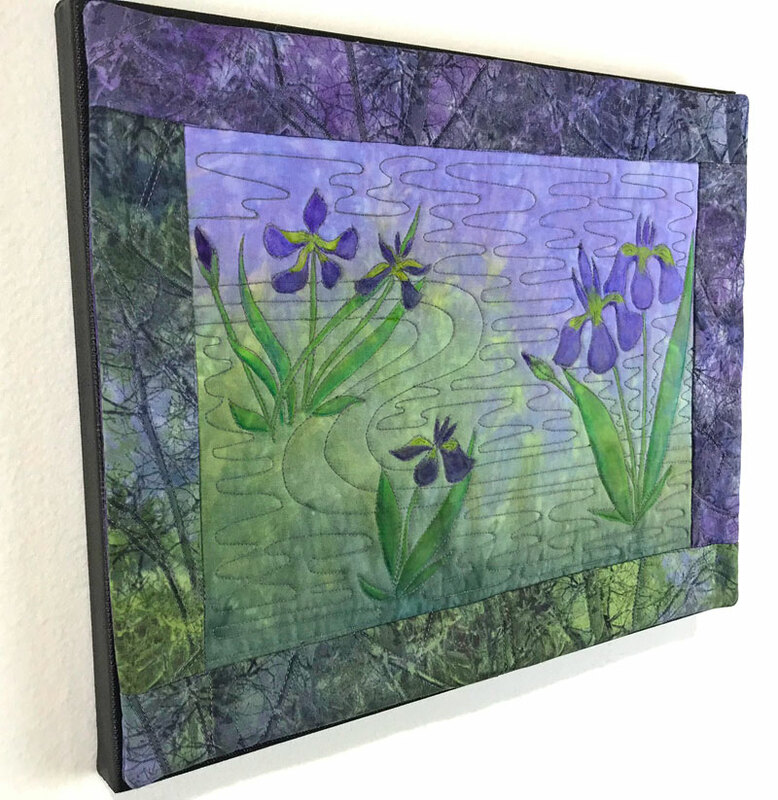 I came to your blog after seeing your post on the Art Quilt page at FB. Thank you for sharing your photos and process description. 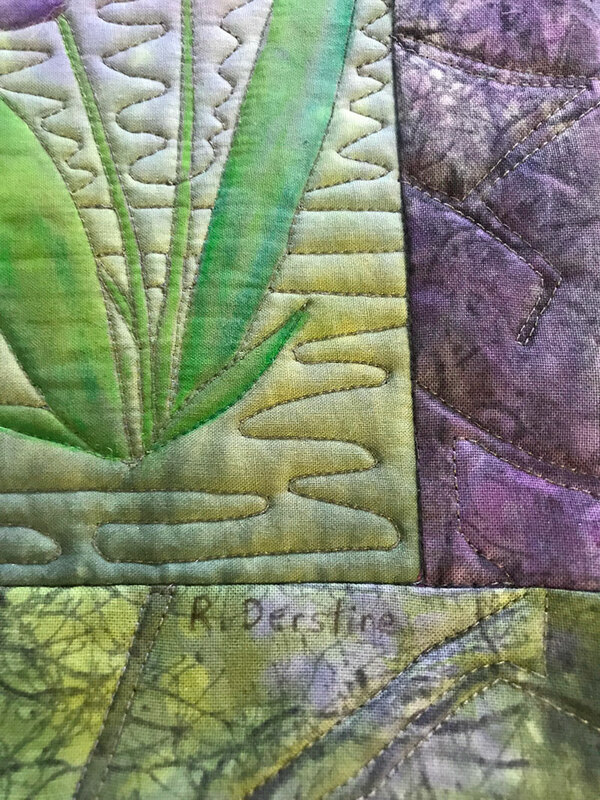 I’m fairly new to using Inktense pencils in my art quilts. Will watch your video also. They are so much fun, Mary. 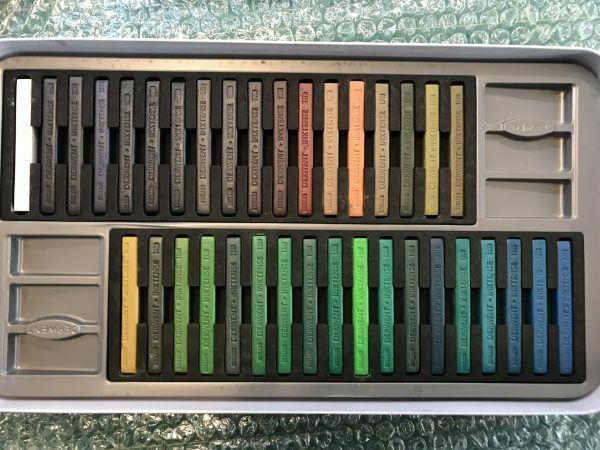 Buy yourself a small set and experiment. Thanks for reading and watching! Thank you for sharing your process. I am new to all of this, and the plethora of techniques is overwhelming. Your description made sense of one of them. I get overwhelmed, as well, Francine! So glad this one made sense to you. Give it a try! Wow – just what I need to Jazz up my current UFO! Thanks so much!